The Evangelical Dictionary of Theology is a Christian reference work published by Baker Books. It was first published in 1984, with a second edition appearing in 2001. The general editor is Walter A. Elwell. It was a successor to Baker's Dictionary of Theology. John Jefferson Davis describes it as a "first-class piece of evangelical scholarship", while David Dockery calls it an "outstanding contribution to the fields of biblical, historical and systematic theology." ↑ McIntosh, John A. (1985). 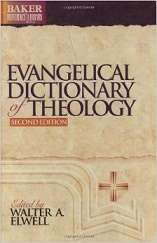 "Evangelical Dictionary of Theology". Fides et Historia. 17 (2): 90–95. ↑ Davis, John Jefferson (1985). "Evangelical Dictionary of Theology". Trinity Journal. 6 (1): 97–98. ↑ Dockery, David S. (1986). "Evangelical Dictionary of Theology". Criswell Theological Review. 1: 200–201.